How agriculture can clean up its air. I gave a talk to the Social Democrats Annual meeting in January about air pollution and climate change. One of the slides titled “Clean air and clean energy” put me in the eye of a Twitter storm because it showed a picture of a nuclear reactor. What followed was not exactly the Vietnam War but the ruffled feathers from the Climate Hawks and Doves certainly flew all around me for two or three days. Climate Hawks come in two breeds. One type does not believe that climate change exists, at least not because of human activities. They will probably soon become hawks that are no more, cease to be etc etc. The other type do believe strongly that we are experiencing an unprecedented rapid global warming and the main culprit, carbon combustion, should be eliminated straight away. They are called Hawks because of their strident belief that replacing fossil fuels and biomass as energy sources will need nuclear power alongside other strategies like hydroelectric as an interim measure before renewable wind and solar technologies can replace all of our needs. I am that breed of Climate Hawk despite knowing all about nuclear waste, Chernobyl and likely effects on natural habitats from building hydroelectric plants. My red line is to keep carbon in the ground and oceans. Not to put it into the air. This crucial connection between land, water and air that controls our natural climate is mainly due to recycling water between its vapour, liquid and solid-ice phases. But in a world experiencing accelerated climate change then it is agriculture, which provides an increasingly important bridge. In Ireland, the EPA have predicted that agriculture will account for almost half of our total Greenhouse Gas (GHG) release in 2020. Because of this worrying prediction, the arguments associated with carbon dioxide and methane releases from the planned growth in Ireland’s dairy and beef herd have been replayed endlessly between farmers, legislators and scientists. As a result few actions have been agreed upon to reduce Ireland’s global warming contribution. Therefore, I am going to describe a way that farmers could make a real difference in reducing our GHG burden. It centres on the often forgotten molecule released into our atmosphere mainly by agriculture and was discovered by Joseph Priestley in 1772. He called it dephlogisticated or diminished nitrous air. Today, chemists call it nitrous oxide or dinitrogen monoxide or N2O. You might have heard of it as laughing gas. 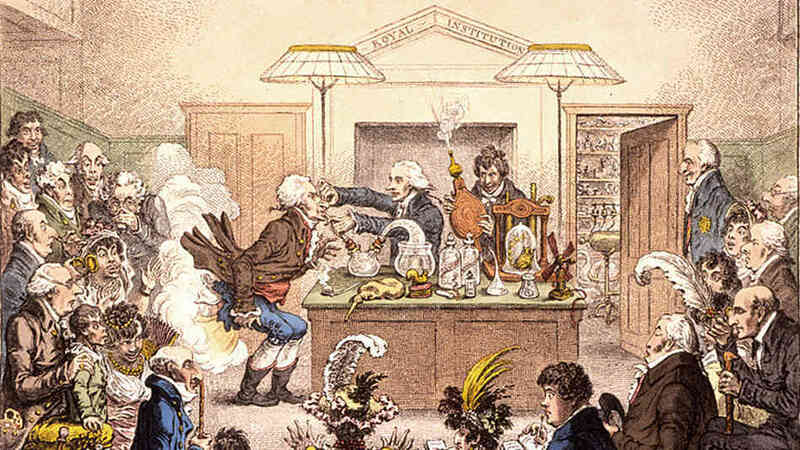 In fact, 1772 was a good year for the discovery of gases that are important to the chemistry of our atmosphere because Priestley also reported the existence of nitrous air (nitric oxide or NO to us) as well as red nitrous vapour (nitrogen dioxide or NO2). These two gases are very much more reactive than nitrous oxide and readily interconvert in our atmosphere; taken together they are termed NOx. Nitrous oxide is easily made by gently heating ammonium nitrate (a key ingredient of many of the fertilizers we use today). In the early 19th century, Sir Humphrey Davy made it in front of paying audiences. Why did they pay? Well Davy, after breathing it in himself, found that N2O gave a feeling of euphoria and, even better, was non-toxic. He charged a few pennies (worth about €25 today) for an inhalation of his laughing gas at his public lectures and its “recreational” use has lasted ever since then. Today capsules can be bought over the internet for less than one euro each and it is now seventh in the 2017 Global Drug Survey of the most popular street drugs. Eventually, nitrous oxide was adopted as an anaesthetic for use in dentistry and is now often used in the food industry for making whipped cream. However when nitrous oxide gets into our air it is much less benign and it plays roles in climate change and stratospheric ozone depletion. The major direct source of nitrous oxide into our atmosphere is from agricultural soils, particularly those treated with synthetic, nitrogen-based fertilizers, where bacteria in the ground convert ammonium and nitrate ions into N2O. More and more of it is being released because of the development of intensive farming practices in the race for greater crop yields. Poorly controlled use of animal waste as fertilizer can also lead to substantial emissions from soil. Currently nitrous oxide globally contributes about 6% of GHG emissions, which is about 1/10th of the carbon dioxide releases. However because of its molecular structure nitrous oxide is about 300x more effective in trapping heat in our atmosphere. So more fertilizer will mean hotter. Fewer people are aware that because of its chemical and physical stability (lasting over 100 years in the air) nitrous oxide can float up to our protective ozone layer, which is found at about 25 km altitude. Ozone keeps out much of the harmful ultra violet (UV) radiation that comes from the Sun and so anything destroying ozone in the stratosphere is not good for our health. Unfortunately, nitrous oxide is broken down into ozone destroying molecules by the UV radiation that reaches our upper atmosphere. So more fertilizer will mean more skin cancer. The breakdown in soil of synthetic, nitrogen-containing fertilizers can also lead to other problems. Depending on environmental conditions, the products are either nitrous oxide, molecular nitrogen or NOx. If the product is NOx, the presence of chemicals like ozone and the effect of sunlight will lead to the toxic mixture we call a smog (smoke + fog). Recent measurements have shown that California farmlands, particularly soils heavily treated with nitrogen fertilizers are now responsible for over 51 percent of total NOx emissions across the state. That is more than transport contributions! More importantly it appears that the emission of NOx gases from soil will also increase as temperatures rise due to climate change. So more fertilizer will mean more respiratory problems. The pathway for farmers is clear: eliminate or, at least, heavily reduce the use of synthetic nitrogen-containing fertilizers. In doing so they should employ land-management strategies which accurately take into account the optimum amounts of fertilizer addition necessary to maximise crop yield and minimise nitrous oxide or NOx release to the air. Establish the best time of year and best weather conditions at which to use fertilizers. And if you do not know what they are then demand that the Origin Green programme run by Bord Bía provides informed and appropriate advice. For more tips go to the recent European Environment Agency report (13/2017) on Air Quality in Europe. Cows are flatulent and belch, yes….but soils are gassy too.